I have had the C7000 juicer now for over one year. I use it every three days, making about 3 litres of juice at a time, storing it in the Kuvings bottles, it keeps for days on end. In 2018, the C7000’s top section was redesigned and now the juicer is perfect. The new top does not block at all, is very fast and it is easy to get apart. The reasons we love this juicer are: its easy to clean up, there are a lot of included accessories, its fast, its quiet, its well made, the service from Kuvings is the best of any company I have ever seen, its super strong and will last for years. Any finally, the juice you get from it is perfect. 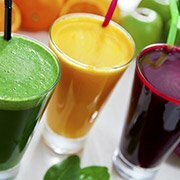 In fact you will be proud to show your juice off to your friends, family and workmates. I highly recommend the C7000. It is great value for money and with the new top it is faultless.